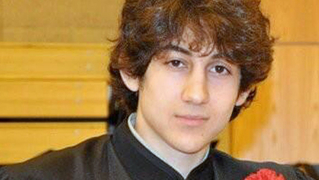 Dzhokhar Tsarnaev Found Guilty: Will Federal Jury Impose Death Penalty in State that Bans It? | Democracy Now! A federal jury has found Dzhokhar Tsarnaev guilty on all 30 charges for his role in the Boston Marathon bombing that killed three and injured hundreds two years ago this month. Tsarnaev was also convicted in the murder of a police officer in the ensuing days. During the trial, Tsarnaev’s defense attorneys admitted he joined his older brother, Tamerlan, in setting off two explosions. The jury will now choose between the death penalty and a sentence of life without parole. Massachusetts bars the death penalty, but the case is taking place at the federal level. We are joined by James Rooney, president of Massachusetts Citizens Against the Death Penalty. JUAN GONZÁLEZ: We begin today’s show in Boston, where a federal jury has found Dzhokhar Tsarnaev guilty on all 30 charges for his role in the 2013 Boston Marathon bombing that killed three and injured more than 260. He was also found guilty in the murder of a police officer. Survivors of the attack welcomed the verdict. This is Karen Brassard. KAREN BRASSARD: I’m grateful to have him off the street. I’m grateful to show everyone, the world, that it’s not tolerated. This is not how we behave. And we’re grateful that everybody’s worked so hard to make it, you know, known that we’re not going to allow this. JUAN GONZÁLEZ: During the trial, Tsarnaev’s defense attorneys admitted he joined his older brother Tamerlan in setting off two explosions, but federal prosecutors still called 92 witnesses to the stand. They set the stage for what comes next. Starting next week, the jury will choose between the death penalty and a sentence of life without parole. We welcome you to Democracy Now! First, can you respond to the verdict—all guilty on all 30 counts—James Rooney? JAMES ROONEY: I guess I’m not surprised. When the lead defense counsel, in her opening statement, says, “My client did the acts that he’s been charged with,” makes the jury’s task pretty easy. So even though there’s 30 counts, it wasn’t really that surprising that they would find him guilty on all counts. JUAN GONZÁLEZ: And the issue of—James Rooney, of the death penalty, the federal death penalty, possibility in this case, and especially in the state of Massachusetts? JAMES ROONEY: Well, obviously, that’s of a concern to us, since we’ve worked long and hard to keep the death penalty out of this state. But as I’m sure you’re well aware, the federal government is a different sovereignty and can charge death cases, whether or not the state where the act took place has the death penalty or not. And indeed, in Massachusetts, we’ve seen the federal government bring a number of death penalty cases. Ten years or so ago, it charged a nurse at a Veterans Administration hospital with killing some patients. That went to trial. It also charged a man named Gary Sampson with killings in Massachusetts and New Hampshire. That went to trial. So this is the third death penalty case in Massachusetts within a short time. AMY GOODMAN: —the oldest in the country. So talk about its history in Massachusetts. What were the cases? JAMES ROONEY: Well, the history of Massachusetts is like many other places. For many years, Massachusetts had the death penalty. Between the 1640s and 1947, when we had the last execution, 345 people were executed in the state. We’ve had many notorious death penalty cases. The ones people, I think, would know the most of were the Salem witch trials and the Sacco-Vanzetti case. And Sacco-Vanzetti is particularly important because it demonstrated certain weaknesses in the justice system in this state. You had questions about the fairness of the trial for these immigrants, and it led to an anti-death penalty movement. That movement worked long and hard, but didn’t really get any success until the 1950s, when one of our founders—our founder, Sara Ehrmann, who was the wife of one of the lawyers who represented the Sacco-Vanzetti on appeal, managed to lobby the Legislature and convince the Legislature to adopt a bill that would allow juries in a capital case not solely to consider death as the punishment, but life imprisonment as the punishment. That’s really the first major victory we had in the early 1950s. After that, it’s involved lobbying governors and lobbying legislatures, and there have been some governors who have opposed the death penalty. And even before the U.S. Supreme Court in Furman in 1972 came down and abolished the death penalty throughout the country for a brief period, we had some success in convincing governors not to sign death warrants. So, you had various actions throughout that period. And then when the U.S. Supreme Court reinstated the death penalty in 1976 in the Gregg case, there was more action in Massachusetts, in essence, between the governor, the Legislature and the courts over whether there should be a death penalty in the state. The courts struck the death penalty down a couple times. Death penalty bills were passed twice. A referendum was held and passed in the state, in which the public said that the Supreme Judicial Court of Massachusetts couldn’t use the Massachusetts Constitution’s due process clause to vacate a death penalty bill. But in the end, the final decision from the Supreme Judicial Court was that the latest death penalty bill passed during Governor King’s administration violated the U.S. Constitution, in essence, because it said that if you pled guilty, you’d get a life sentence. But if you went to trial, you risked getting the death penalty. And the court felt that that was an undue imposition on the right to a jury trial. And that’s the way it stayed. JUAN GONZÁLEZ: I wanted to ask you, because you mentioned earlier the Sacco and Vanzetti case. For those folks who are not familiar with that case, especially given that it was—has a lot of similarities to the current situation, because it was a political terrorism, supposedly, case, wasn’t it? JAMES ROONEY: Yes, it was a political terrorism case. I mean, the terrorists of the age were anarchists. And anarchists would blow up people in an effort to disrupt society, and thereby somehow create a new one. And Sacco and Vanzetti were definitely members of a terrorist organization. And they were charged with committing what amounts to a daring daylight robbery of a payroll officer and his security guard. And so, the alleged motive was related to their anarchist activities, and a lot of their anarchist activities came out during the course of the trial. And so that became controversial as to whether or not they were convicted because the evidence really demonstrated that they committed the crime. Controversy remains about that, and there are views on both sides. I mean, our organization thinks that Sacco and Vanzetti were wrongly convicted, whether or not you think they did it or not, because the trial ended up being so prejudicial about their immigrant background and about their political views. AMY GOODMAN: I want to turn to the current secretary of state, John Kerry, speaking about the death penalty, not today, but in 1996 during a debate when he was running for U.S. Senate from Massachusetts. He was debating William Weld, who was then the state’s governor. This excerpt begins with Weld, then we hear from Kerry. GOV. WILLIAM WELD: Senator, over the course of the last six years and earlier, when I was in the Justice Department, I’ve had occasion to work with the families of many people who have suffered the loss of loved ones through murder, and the families of police officers. I have gone to six funerals in the last three years of police officers who were cut down in the line of duty. I, as you know, am a proponent of the death penalty. You have been a longtime opponent of the death penalty, even for cop killers. Could you look into the camera, perhaps at Anne Schiavina, who’s here, whose son was a Springfield police officer cut down by a murderer, tell her why the life of the man that murdered her son is worth more than the life of her son, the police officer? SEN. JOHN KERRY: Well, Governor, I would say to you, I would say to her, and I would say to every citizen in this country, it’s not worth more. It’s not. It’s not worth anything. It’s scum that ought to be thrown into jail for the rest of its life and that ought to learn day after day the pain and hell of living with the loss of freedom and with the crime committed. But the fact is, Governor, that, yes, I’ve been opposed to death penalty. I know something about killing. I don’t like killing. And I don’t think a state honors life by turning around and sanctioning killing. Now, that’s just a personal belief that I have. AMY GOODMAN: That was John Kerry in 1996. In 2002, after the September 11th attacks, Senator Kerry said, “I support killing people who declare war on our country, just as I was prepared to kill people personally and collectively in Vietnam.” Your response to this, James Rooney? JAMES ROONEY: Well, I obviously agree with Senator Kerry’s first statement. And the difficulty I think we face in dealing with terrorists who are attacking us is that, by and large, the people who are attacking us for terrorist motives, they themselves don’t seem to be all that worried about losing their lives. Obviously, in the 9/11 attack, to which Senator Kerry was responding, all 19 of the bombers killed themselves along with all the people who died in 9/11. So, it doesn’t seem to make sense to try to deal with terrorists, who are perfectly willing to martyr themselves, by saying the punishment is the death—is death, which you seem to already wish for. Punishment should be something that the perpetrator doesn’t want, not something that appears to be their goal. JUAN GONZÁLEZ: And, James Rooney, in the decision of the jury, they begin deliberations next week on the death penalty. Could you talk about your expectations? And is it a requirement of a unanimous verdict by the jury? JAMES ROONEY: I believe, under the federal scheme, it is. That’s not uniformly true throughout the states. Kansas, for example, has a scheme in which if the jury is deadlocked, then it defaults to death. The U.S. Supreme Court has upheld that. But the federal scheme does require that the jurors all agree. In the case I mentioned earlier in which a Veterans Administration nurse was charged with death penalty crimes, she was convicted of those crimes, and the jury split eight for death, four for life, and that ended up being a life sentence as a consequence. AMY GOODMAN: Go ahead with what you were saying. JAMES ROONEY: Now, what’s going to happen in the upcoming trial? I think we have some preview of it from the guilt phase. It seems to me the prosecution is going to attempt to claim that Tsarnaev was a dedicated jihadist and that he’s a calculated, cold-blooded killer, who, after he kills people, goes off and buys milk. And the defense is going to argue that he was a misguided youth under the sway of his older brother, whom he looked up to. AMY GOODMAN: James Rooney, as we begin to wrap up, I wanted to ask you about what a death-qualified jury means, what it means when you have a death penalty case. The selection of the jury in the case—forget the debate over the sentencing right now—you have to agree with the death penalty, is that right? If you are against the death penalty, you cannot serve on the trial, serve as a juror in the trial. JAMES ROONEY: Well, in essence. If you say you’re against the death penalty and would never be willing to consider it, no matter what the evidence, then you can’t serve on the trial. What you have to be able to say to serve on a death-qualified jury is, if the prosecution proves its case and demonstrates that the aggravating circumstances outweigh the mitigating circumstances, I would be willing to vote for death. So you could be a nominal opponent of the death penalty but be willing to follow the law in this case. JAMES ROONEY: It certainly does. AMY GOODMAN: —to the death penalty, is that overwhelmingly Jews and African Americans, would not be able to serve on the trial, during the trial. JAMES ROONEY: That’s right. And the data on that show that the people who would fit—the pool of people who would be eligible for a death-qualified jury are, in general, more likely to vote for guilt than if you picked from our broader range of people. And in this state, when you’re picking a death-qualified jury, you have lots of people of lots of different backgrounds who are opposed to the death penalty, across the board or in specific cases. And so, when you say that the jury reflects the community, in this case it’s not the whole community, it’s a much smaller segment of the community. AMY GOODMAN: James Rooney, we want to thank you for being with us, president of Massachusetts Citizens Against the Death Penalty. In March, he helped organize a symposium called “The Tsarnaev Trial: The Federal Death Penalty in Abolitionist Massachusetts.” We will continue, certainly, to follow this case. This is Democracy Now! When we come back, we’ll be joined by the aunt of the man who filmed not the case in South Carolina, but the attack on Eric Garner in Staten Island. Ramsey Orta, in that whole situation, is the only person to have been arrested—not the police officers or anyone involved with the killing of Eric Garner, but the young man who was standing nearby and filming. Stay with us. As Video Exposes Walter Scott Police Killing, Why is the Man Who Filmed Eric Garner’s Death in Jail? NEXTAs Video Exposes Walter Scott Police Killing, Why is the Man Who Filmed Eric Garner’s Death in Jail?